Save 20% OFF these popular selected McArthur Natural Products with coupon code SPRING20% and also receive a Free Surprise Gift with every purchase. For a limited time only, while stocks last. Offer expires midnight WST Friday 30th September, 2016. Not available in conjunction with any other offer. To take advantage of this offer enter the coupon code SPRING20% at the final stage of the checkout to receive 20% OFF. Need a hand? You can also telephone our office on 1800 729 729 and we can assist in processing your order during office hours. The Free Surprise Gift with Every Purchase will be added to your bundle by our packing team and won’t appear in your checkout. Remember to save even more with FREE Shipping on orders over $80 Free Shipping threshold within Australia. Eczema Cream – Contains the active natural ingredients Chamomile, and Chickweed which is traditionally used in herbal medicine for the relief of itchy, irritated and inflamed skin associated with mild eczema. Psoriasis, Dermatitis and Rashes Cream – Contains the active natural ingredients Aloe Vera, and Chickweed which is traditionally used in herbal medicine for the relief of itchy, irritated and dry skin associated with mild psoriasis, dermatitis and rashes. Spring is in the air! A lot of people really love Spring and it is the favourite season for many. 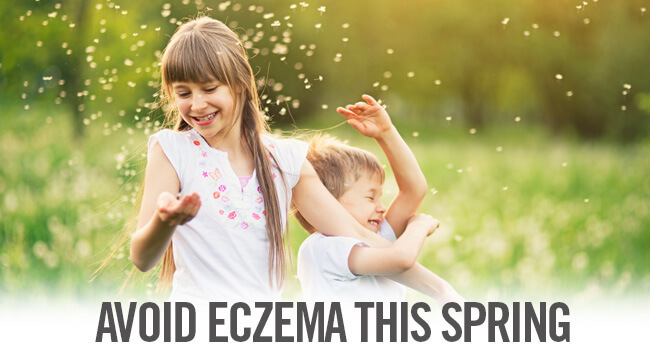 However, Spring can be a challenging time for some, because Spring signals the start of pollen sensitivity as well as warmer weather – both known triggers for eczema. According to the Australian Society of Clinical Immunology and Allergy, the skin barrier in eczema sufferers does not work as well due to the skin having a lesser ability to retain water, thereby easily losing moisture and leading to drying of the skin. When the skin barrier is damaged, moisture evaporates making the skin more susceptible to allergens and irritants. This irritation can trigger the skin to release certain chemicals that make the skin itchy. Scratching releases more chemicals making the skin feel even itchier and so the cycle continues. Hydrate – drink plenty of water to help keep the skin hydrated. Stay cool – try to prevent sweating which can aggravate eczema. Avoid being outside during the hottest part of the day by organizing outdoor activities early in the morning or later in the afternoon. Avoid hot showers. Wear loose cotton clothing – cotton breathes better than other fabrics, will help to prevent sweating and is less likely to irritate the skin. Swim in sea or salt water – in preference to chlorinated pools. If this is not possible, rinse off chlorinated water as soon as possible, pat dry and moisturise. Avoid soap – use a non-soap based bodywash or gentle cleanser instead. This will help replace the oil content of the skin. Soap and foaming products can damage and dry out the skin. Moisturise – with a product formulated for the relief of mild eczema as frequently as possible (two-three times per day) and always after a shower or bath. Avoid known triggers and irritants. At McArthur Natural Products we understand how challenging it can be to live with mild eczema. Please remember to always read the label. Use only as directed. If symptoms persist see your healthcare professional. 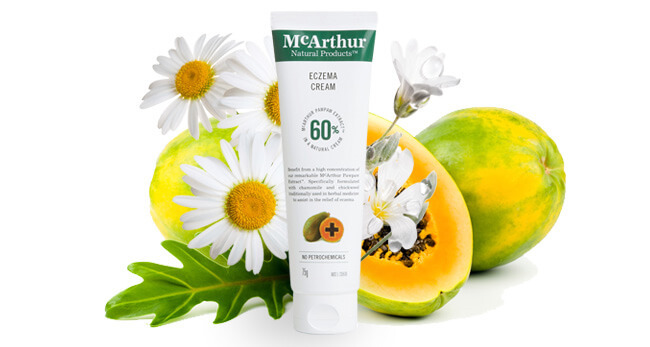 The McArthur Natural Products’ range is made in Australia from Australian grown pawpaw and contains no petrochemicals, parabens or added sulphates.